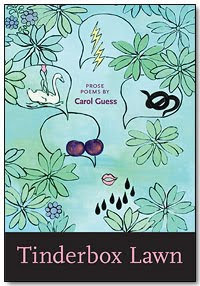 Reading Tinderbox Lawn by Carol Guess is akin to remembering your dream. The pieces of the story are fragmentary. There is a struggle to weave a narrative thread between them and more often than not, the dream can be interpreted any number of ways depending on how it’s hemmed. Tinderbox Lawn is a collection of prose poems that function in a similar way. Each poem looks like a paragraph, a block of compact text on the page. The poem--its spacing and line breaks--have been compressed. Because of this condensation, the images, language, and musicality have been refined as well. These poems are muscled. Each poem functions as a stand-alone piece of work, but there is also a narrative--often fragmentary, that joins the poems into a singing whole. Is there a plot with this start and stop method? Definitely, but not one that most readers of prose and novels expect. The storyline of Tinderbox Lawn functions like a strobe light, focusing the reader’s attention to highly illuminated points of the narrative. Guess’s poems tell the story of two women falling in and out of love against the backdrops of Seattle and Bellingham. True to locale, the Green River Killer, the politics of the war in Iraq, and even strippers make appearances among the poems. Tinderbox Lawn’s poems aren’t shy. There are no names for the characters except for the voice of the speaker, the lyric “I,” who addresses the reader as “you.” This device creates a continuous intimacy between the author and the reader. “In another incarnation you’re sitting on a dock, dangling / your legs over the edge. You’re new, and in this chapter / I’m new too…” Guess consistently draws the reader into the tapestry of her poems with a conspiratorial voice, startling images, and sometimes, explosive violence. The musical quality of Tinderbox Lawn’s language is joyous. Many of these poems demand to be read aloud. Guess’s poems dance with sound, both jarring and sonorous. Guess's collection is an example of prose poetry at its best: highly textured, compact, and sharp. But, the work will not please every reader. Those looking for straightforward poems or prose may find themselves flummoxed. Guess’s work demands that the reader collaborate in the reading process, requiring him or her to fill in some gaps. The pacing can also leave the reader occasionally out of breath from trying to keep up. Taking each poem individually or collectively as a novel in fragments, the reader of Tinderbox Lawn is rewarded for their effort. Guess’s work sets a high standard for any prose poetry to come.